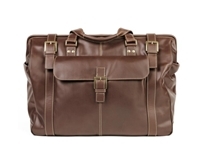 Boconi Duffel Bags...sleek, refined classic duffel bags. Super mellow milano grained leather & lightweight, on-trend canvas, lined with sophisticated khaki and finished with antiqued nickel hardware. Looking for a special Boconi Bag? Please don't hesitate to contact us with any questions.